Never before has a more powerful anabolic formula been developed that is clinically-proven to jack testosterone levels faster than new MUTANT TEST™. TestoSurge™ is the proprietary, patent-pending, bioactive compound in the MUTANT TEST formula that works through multiple physiological pathways to quickly raise and protect your test levels, which can lead to freaky gains in muscle size and strength. 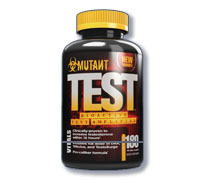 MUTANT TEST delivers this amazing new ingredient that is proven to crank up test levels like no other. No more waiting days, weeks, or even months to blast your test levels through the roof — now you can have more juice in just hours! MUTANT TEST works through a premium dual-action pathway to maximize and protect your testosterone by a) inhibiting the aromatase enzyme and b) minimizing testosterone conversion to DHT (dihydroxytestosterone) — a male hormone linked to negative androgenic side effects. By inhibiting the aromatase enzyme complex, MUTANT TEST prevents aromatization and the conversion of testosterone to estrogen, minimizing unwanted side effects such as edema and gynecomastia. Secondly, MUTANT TEST then fights to protect your testosterone by inhibiting the 5á-reductase enzyme, responsible for destroying your test and producing the unwanted metabolite DHT. The primary functional ingredient in MUTANT TEST, has been clinically evaluated using the Gold Standard method of research — a randomized, cross-over, double-blind, placebo-controlled study. Previously-trained test subjects consumed either a single-dose of MUTANT TEST's primary ingredient or placebo and were evaluated over a 12-hour period. Subjects consuming the key ingredient in MUTANT TEST significantly increased total testosterone 376% over the placebo group in only 12 hours (Table 1 and Table 2). In the same published human-performance study, free 'unbound' testosterone increased by 144% change over the placebo group. Free unbound testosterone is the only form that can activate testosterone receptors for increased muscle growth and strength. What does quickly cranking up test levels mean for you — the guy who is serious about building freaky mutated muscle? It means no more waiting for your test booster to "kick in." With MUTANT TEST in your mutated feeding schedule and iron pumping plan, you'll have jacked test levels for bigger lifts and noticeable muscle gains. Nothing works better or faster than new MUTANT TEST. We back that promise with published clinical studies. Directions: On training and non-training days, take 5 MUTANT TEST caps every morning upon waking on an empty stomach with 8 ounces of water.